The U.S. Air Force has accepted the first Boeing KC-46A Pegasus tanker aircraft, setting the stage for the aircraft’s delivery to McConnell Air Force Base (AFB), in Wichita, Kansas, in the coming weeks. «The KC-46A is a proven, safe, multi-mission aircraft that will transform aerial refueling and mobility operations for decades to come. We look forward to working with the Air Force, and the Navy, during their initial operational test and evaluation of the KC-46, as we further demonstrate the operational capabilities of this next-generation aircraft across refueling, mobility and combat weapons systems missions», said Leanne Caret, president and CEO of Boeing Defense, Space & Security. «I want to thank the men and women of the Air Force and across the Boeing tanker team who made this happen». During extensive flight testing, six Boeing KC-46A Pegasus completed more than 3,800 flight hours and offloaded more than four million pounds of fuel to Fairchild Republic A-10 Thunderbolt II, Boeing B-52 Stratofortress, Boeing C-17 Globemaster III, McDonnell Douglas KC-10 Extender, Boeing KC-135 Stratotanker, Boeing KC-46A Pegasus, McDonnell Douglas F-15E Strike Eagle, General Dynamics F-16 Fighting Falcon and McDonnell Douglas F/A-18 Super Hornet aircraft. The Boeing KC-46A Pegasus has been rigorously tested throughout all aspects of the refueling envelope and in all conditions, including day, night and covert. With the signing of what’s known as the DD250 paperwork, the delivery activities can proceed. 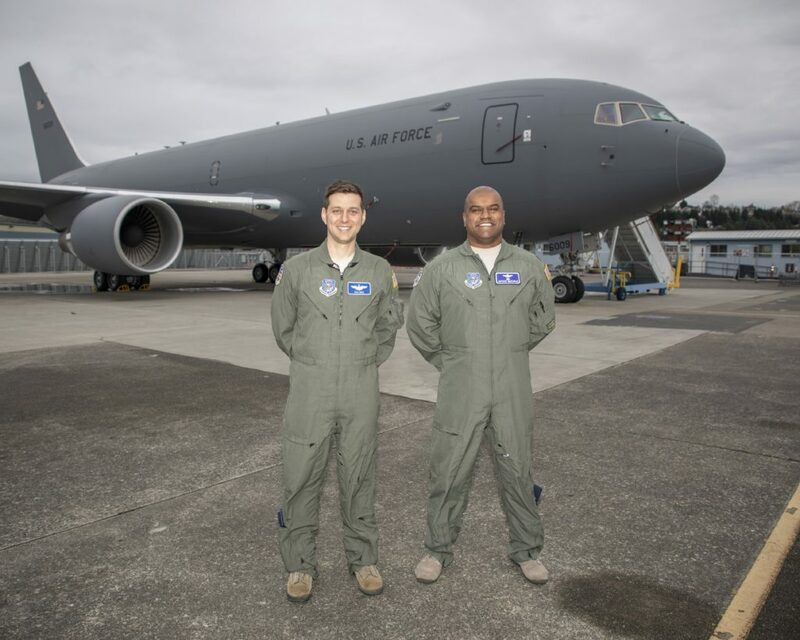 McConnell Air Force Base will receive the first four Boeing KC-46A Pegasus aircraft, all of which are ready for delivery, with four subsequent aircraft destined for Oklahoma’s Altus Air Force Base, beginning as early as next month. «This is an exciting and historic day for the Air Force and Boeing, as we hand over the first of many KC-46 tankers», said Boeing Chairman, President and CEO Dennis Muilenburg. «I’m proud of the dedication and commitment by our enterprise-wide team, and we’re honored to provide this valuable and capable aircraft to our customer. We look forward to continuing to build and support the KC-46 for the Air Force – and other customers across the globe – for decades to come». The Boeing KC-46A Pegasus, derived from Boeing’s commercial 767 airframe, is built in Boeing’s Everett, Washington, facility.